Tired of the same old vacations: fishing the Kellith Sea off the city of Darak, or viewing the mountain vistas from Hammon? You may not know it, but the three major cities of the Continent have unexpected treasures! I recently visited three areas that are off the beaten tourist path, and I highly recommend them to you! Tarnath, a very old city, was always small but important. Its location on the northern shores of the Bay of Perrin makes it one of the best seaports on the eastern side of the Tamarran Continent. The old city of Sessmaryth is perfect for exploring the mysterious remains of the infamous Emperor Samron. There remain many mysteries dating back to Samron’s time or before. There’s the North Gate, which served as the entrance into the City of Sessmaryth during its heyday. Is there really a series of tunnels below the city and region, once used for travel throughout the valley? And what is hidden beneath the hill that once held on its crown the massive Palace of the Emperor Samron? Naldrin City was founded by both ishiri and dwarves, and is known for its architectural splendors. The five tiers of the city were made by ishiri and dwarves. The ishiri, who love rock and stone, built along the mountain ranges; the dwarves built below it. Over the years, there have been many altercations between ishiri and dwarves, each claiming original ownership of the territory, but they have managed to co-exist. Home to the Council of Drawnwyn, which speaks for almost all of the most powerful kingdoms and nations on the Tamarran Continent, Naldrin City is often considered the unofficial capital of the Tamarran Continent. The Quiets are ruined areas, casualties of the Stillness Wars, that lie outside of Jowea. The Quiets are areas of Stillness energy, and are controlled by undead. This makes travel into and out of the Region of Jowea quite dangerous, and as a result the region is isolated in many ways from the rest of the continent. However, good guides can be found both in Jowea and in some of the non-Quiet areas outside. 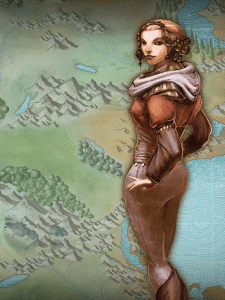 The City of Afforin is known for its political intrigue and spycraft. In this city, politics is a game: in fact, it is the game, and it can be a bloody one, so be careful where you venture. The city is ruled by a single lord, who rules over four separate areas of the city (the Orchards, the Merchant District, the Villas, and the Circle), which are each ruled by their own underlord. However, the political hierarchy goes much deeper and pervades all of the culture of the city. The City of Dovvan, which is almost entirely populated by dwarves, is known for high-quality metalwork and jewelry. The Jowen Dwarf Clan, which lives under the neighboring mountains, produces artifacts renowned for their craftsmanship and delicacy. These crafts are a source of much of the trade flowing within and outside of the Region of Jowea. Wherever you end up going, enjoy the places you see and the creatures you meet. Happy adventuring!